“My mom is a good person. She’s not a criminal,” Pamela said, cursing at the immigration agency before her mother checked in for her flight from Orlando International Airport. Temo didn’t figure his vote for President Donald Trump would affect them personally. That was before the enforcement of Trump’s “zero tolerance” policy toward illegal immigration. U.S. Rep. Darren Soto, D-Fla., who couldn’t get the votes in Congress for legislation to allow Juarez to remain, called her situation disgraceful. “We’re not going to give up,” he told her with a hug at the airport. 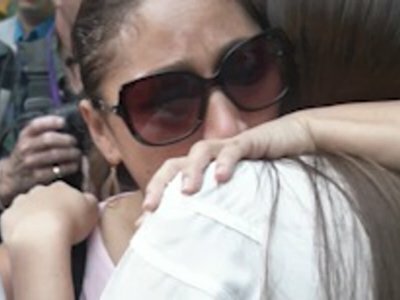 Alejandra ultimately decided to “self-deport” to Mexico, rather than turn herself in to be detained and then deported. After 20 years in the United States, she no longer has family or friends in the country, so she chose Merida, a city in the Yucatan where a small community of deported military spouses might help her. Emotionally spent, she wiped her own tears behind sunglasses and stroked Pamela’s hair while gripping Estela, who stood by her side. Temo said he preferred not to talk before they were all escorted through security for their final goodbyes.